France international Anthony Martial has dropped a subtle hint regarding his Manchester United future following the 2-2 Premier League draw against Chelsea on Saturday afternoon. Martial recently bagged his maiden goal since February during the epic 3-2 comeback win over Newcastle United and he managed to continue his glowing form against the Blues where he bagged a sublime second-half brace which nearly took the club to victory. 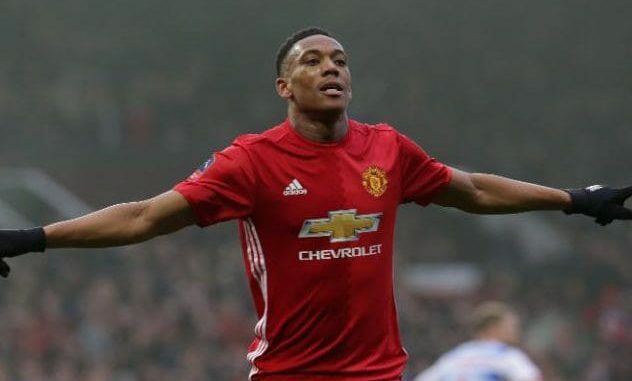 Following the game, Martial took to reassure the supporters that he is committed to the Red Devils after posting a picture of himself pointing towards the club’s badge on his shirt after scoring one of his two goals at Stamford Bridge. Martial’s representative had initially sought to discuss a new contract with the club’s hierarchy nearly a year ago but his advances were snubbed by the board, who later on sanctioned the winter signing of Alexis Sanchez from Arsenal. Thereafter, there has not been much activity in terms of extending the Frenchman’s contract but a recent report from Metro has indicated that the club are now confident of committing his future on a fresh five-year contract. One of the prime concerns for Martial had been the reduced gametime offered after Sanchez’s arrival but things appear to be sorting out presently with the Frenchman picking up his form with three goals from the previous two league appearances.